Setting up an FTP connection on a windows machine is really easy just follow this simple guide to get connected! First off you will need an FTP Client I recommend you use FileZilla. You can download it from here. I will be using FileZilla throughout this tutorial so if you're new to FTP this is your best option. Note: Change the "Logon Type" to normal this will allow you to enter a username and password. Before we can proceed you will need to find out your FTP information to do this, head over to your server overview and on the left hand side you will see an option labeled "FTP Settings" this has all the information you require. 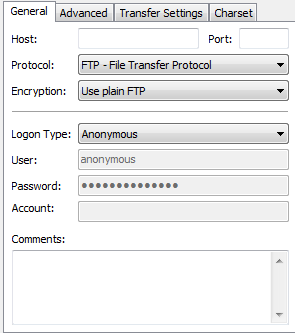 Use this information to now fill in your FTP Client form as shown in the image above. Once you have have filled out the form click Connect and you have now connected to your server via FTP! 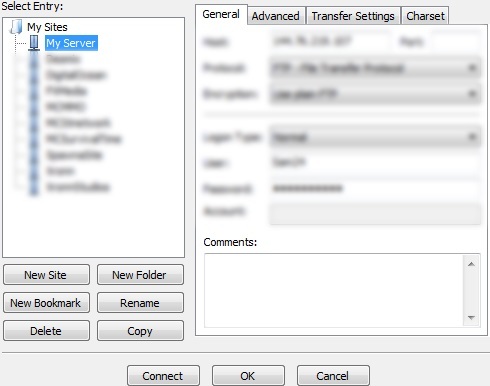 In future you will be able to connect to your servers FTP again by clicking File > Site Manager (CTRL+S) and down the left hand side you will see your FTP server, select it and just hit connect and you will be connected once again. If you have any problems connecting to your server via FTP feel free to create a support ticket on the link below.